Take a Look at What Our Past Customers Had to Say About Us! "We went to the January Home Improvement Show looking for a company to reface our existing kitchen cabinets. We walked into the 123 Cabinets Direct display and met Florin. He told us 123 Cabinets Direct could install new kitchen cabinets for a fraction of what we could have the old kitchen refaced. That piqued our interest. After leaving the Home Improvement Show we drove down the road to the 123 Cabinets Direct showroom and meet Sam and Chris. We looked at all of the different choices of cabinets, so many styles and colors, we were impressed. We were also impressed with the prices that we saw. We used the coupon that we received at the Home Improvement Show to schedule a free in home measurement (a $75.00 value). Before 123 Cabinets Direct came to our home, I did an internet search for them. Looking at that website, we saw an idea that we had not thought about for our kitchen. Florin came out to our home to take the measurements. While he was here, I showed him the picture from the website. He measured again and said that he would include the new wall idea into the quote for us. A few days later we had a proposal and a computer layout of our new kitchen. 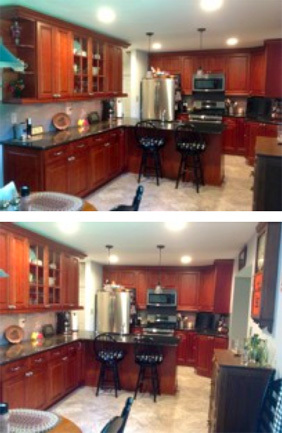 When we saw the quote, including a new wall of upper and lower cabinets, we were amazed at the price. It was a fraction of the quote we received from a big box store for re-facing only! We had updated our kitchen with new granite counter tops five years ago and wanted to keep the granite countertops. 123 Cabinets Direct has a relationship with Custom Granite in Farmington Hills, MI. We had Custom Granite come our to quote us the removal of the existing countertops, match the granite and install a new tile backsplash. By mid-March all of the decisions and measurements had been made. We ordered the new cabinets on March 18 and scheduled installation for April 1. Custom Granite came and removed the existing countertops and we stored them in our garage. We began the demolition of our kitchen, we removed the old cabinets (donated them to a local church) and had the kitchen prepped for the April 1st install. On April 1st Jay and Mike came to hang our new kitchen cabinets. Jay is very professional and an expert at installation/leveling the cabinets. Florin stopped over each day to see how things were coming along. Our new cabinets were completely installed by the end of the day, Wednesday. On Thursday, Custom Granite came back to reinstall our old countertops and install/seam the new granite countertop. The following Monday, Custom Granite came back to install our new tile backsplash. We are so happy that we stopped at the Home Improvement Show and invited them into our home to give us a quote. If you are looking to make improvements to your kitchen cabinets, look no further than 123 Cabinets Direct." How was your experience with 1.2.3. Cabinets Direct? We truly value every one of our customer's feedback. If you can take a moment to share your experience with the rest of our community and tell us how we did, we would greatly appreciate it! Let us know your availability and we’ll contact you to schedule a free measure & design. Free measurements only valid for customers within a 20 mile radius of each location. “Working with Dan and the staff has been nothing short of awesome. Mon, Tue, Wed, Fri: 9AM - 5PM Thursday: 10AM - 6PM Saturday: 10AM - 2PM Sunday: Closed After hours available by appointment! The contents of this webpage are Copyright © 2019 123 Cabinets and Counters Direct. All Rights Reserved.